"He served as a Clearance Diver in the Royal Australian Navy before transferring to a Special Operations unit within the Australian Army where he worked as a sniper. Following the completion of military service, Damien joined a Private Military Organisation tasked with retraining the future police of Iraq. He eventually moved to the position of Project Manager, overseeing daily operations of the Iraq Special Police Training Academy in Baghdad, before working alongside the US Army Core of Engineers, involved with reconstruction efforts. Damien returned home to Australia from Iraq in 2008 after three years service. Arriving in Africa at the beginning of 2009, the intention was to apply his background skills to wildlife protection and conservation. After traveling the Southern half of the continent he came to rest in Victoria Falls, Zimbabwe. It was in Zimbabwe that he realised he could not turn his back on the decimation poaching was having on wildlife populations. 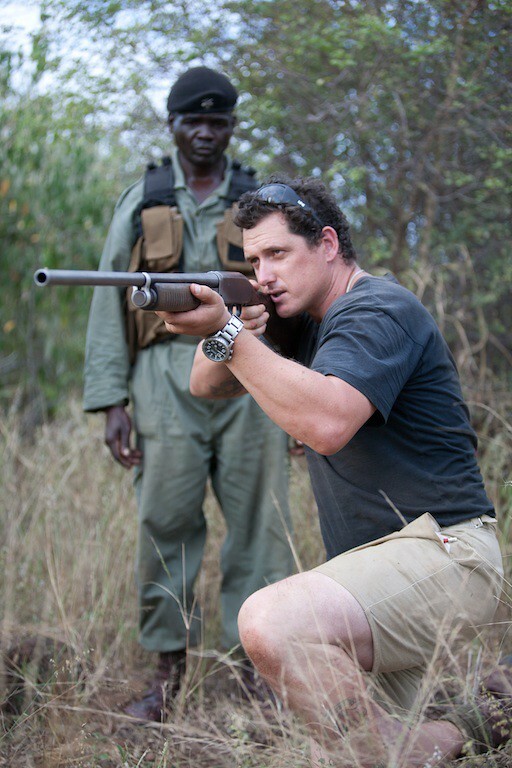 Incensed by the lack of resources made available to combat the problem he founded the International Anti-Poaching Foundation (IAPF), designed to counteract the bloodshed through assertive action and specialist tactics & training. He has since been working very closely with other conservation organizations with similar objectives. Together with Jason Hartman, Damien is also a director of Conservation Guardians, an association based out of the Principality of Monaco with the mission to protect and conserve wildlife and bring support to communities. His partnership in Rock 'n Ride 4 Rhino is a natural extension of his conservation work." In an age where so many wanna-be "men" are revving up their bravado with a bully's fist aimed against the innocent and helpless, here comes this authentic champion equipped and able to fight for justice and compassion! This is fantastic! Thank you Bea and CQ, for showcasing this very positive model of wildlife protection and interaction. What a brilliant way to use those skills in the interest of planetary goodness. Can you imagine more Damien Mander's opted to channel that experience into such noble and critical endeavors! The world certainly would be a different place ... for the better. I couldn't agree with you more Ingrid that Damien Mander is putting his (otherwise harmful) skills to a very worthy end. He also has a wonderful way of stating his truth of compassion... I know already from feedback that he's made some people question their position on extending kindness to all. Let's hope he can win the other wild-life war as well. veganelder... A vegan with a weapon. That's almost an oxymoron - Except knowing how many murderers there are out there it makes it seem like there's just *not enough* vegans with guns! Guns used to protect the innocent. I can enthusiastically get behind that movement! Seek and destroy the harmers!